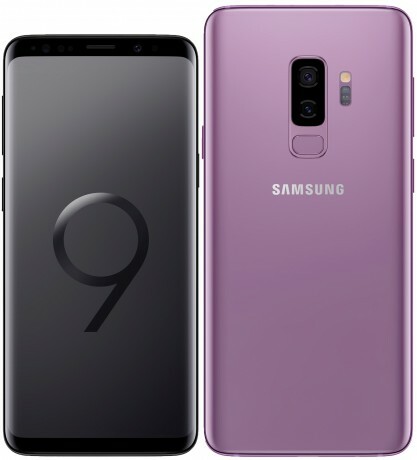 Samsung today announced the Galaxy S9 and S9+ phones, updates to last year's S8 models. The devices bear a striking resemblance to their predecessors and make only modest changes to the hardware. The S9/S9+ feature 2:1 screens with slightly reduced bezels and glass panels front and back. Most significantly, Samsung rotated the camera/fingerprint module so the reader is in a central location on the rear. The phones also adopt stereo speakers with Dolby Atmos and produce louder sound than the S8/S8+. The S9/S9+ carry over features such as the waterproof chassis, USB-C port, headphone jack, and dedicated Bixby button. Samsung made significant improvements to the camera. The 12-megapixel cameras now include switchable aperture, from f/1.5 to f/2.4, to help with low-light situations. The camera sensor includes embedded DRAM memory — similar to Sony's premium phones — that allows the S9/S9+ to capture 960fps slow-motion. The slow-mo mode includes a motion detection function so it knows when to slow down the video for maximum effect. Each phone also includes an 8-megapixel selfie camera, along with face and iris scanning for security. Samsung added AR Emoji, a tool that echos the Animoji feature on the iPhone X to a certain degree. Users record their face which is then turned into a cartoon avatar and applied to 18 different personalized GIFs. The AR Emoji also let users animate faces such as a devil, and even apply (and purchase) various types of makeup. Further, S9/S9+ owners can easily save and share the AR Emoji with most other devices. Samsung says the S9/S9+ include a more refined version of Bixby that is now able to recognize more actions. More importantly, Bixby Vision now works in real-time, allowing for instant language translation and searches when viewing items through the camera. The devices ship with Android 8 Oreo, the Samsung SmartThings app, and the latest version of Samsung's DeX software. Samsung's SmartThings will allow the S9/S9+ to interact with other connected Samsung devices, such as refrigerators. The DeX software now works with a new dock that lets the phone act as a virtual mouse and/or keyboard. The S9 includes a 5.8-inch quad HD+ screen and 3,000mAh battery, while the S9+ includes a 6.2-inch quad HD+ screen and 3,500mAh battery. The only other difference in the hardware is found on the rear of the S9+, which features a second camera for 2x telephoto images. Both phones rely on the Qualcomm Snapdragon 845 processor with 4 or 6 GB of RAM and 64 GB of storage. The phones support microSD cards up to 400 GB. Preorders for the Galaxy S9 and S9+ kick off March 2 and the phones will reach stores March 16. Samsung is offering up to $350 for trade-ins when put toward the purchase of an S9/S9+. The phone will be sold in black, purple, and blue in the U.S. AT&T, Cricket Wireless, MetroPCS, Sprint, T-Mobile, U.S. Cellular, Verizon Wireless, and Xfinity Mobile all plan to carry the phone. It will also be available form Best Buy, Amazon, Costco, Sam’s Club, Target, and Walmart. Pricing is about $799 for the S9 and $899 for the S9+.